Sixth, the Strategy makes clear that if no further measures, in addition to those already agreed, are implemented that man-made particulate matter air pollution alone will result in a health impact in the UK in 2020 that is still estimated to cost up to £6.2-14.7 billion per annum (i.e. an average reduction of life expectancy in the UK of 5.5 months still in 2020) (see Volume 1, page 42). This is astonishing when European Union legal limits for particulate matter were due to have been met by January 2005 since 1999 legislation (and January 2010 for nitrogen dioxide). “Why is it that the Government is considering such an inadequate response to such a serious air pollution health problem and such an opportunity for massive financial costs savings? Even successful implementation of the Government’s latest package, of “New measures to be considered” and “Measures requiring additional development work”, would only improve seemingly the average reduction in life expectancy in the UK by a further two weeks in 2020 to 5.0 months (see Volume 1, page 3)? Bear in mind too that these are averages across the whole UK and the Strategy says that 84% of urban roads in England met the objective in 2003 – what cost then to those near the other 16% of urban roads… (see Volume 2, page 213)? The Government admits in the Executive Summary that it is “projected to miss objectives on three of our nine pollutants (particles, ozone and nitrogen dioxide)” (see Volume 1, page 7). The Executive Summary does not mention however that there appear to be problems meeting objectives for Polycyclic Aromatic Hydrocarbons (which is believed to cause an “increased incidence of tumours of the lung, skin and possibly bladder and other sites”) for the foreseeable future (see Volume 2, page 87), for Benzene (which is a “recognised genotoxic human carcinogen”) at “a small number of roadside locations in London” (see Volume 2, page 92) and for Sulphur Dioxide (which is an “irritant gas that, in high concentrations, provokes broncho-constriction i.e. narrowing of the airways”) where the UK seems to been in ongoing breach of European Union legal limits (see Volume 2, page 72). A Strategic Plan without any proposal to meet key European Union legal limits (e.g. particulate matter and nitrogen dioxide) does not seem to be making “reasonable efforts” to do so. Why also is the Government dropping measures that might provide “significant benefits for example by helping achieve legally binding European Union limit values” (such as providing incentives to phase out the most polluting vehicles, helping London with its Low Emission Zone, retrofitting Diesel Particulate Filters to heavy duty vehicles and captive fleets and setting product standards for gas fired domestic appliances) (see Volume 3, page 12) and delaying those like road pricing that offer 70% reductions in peaks of air pollution (see Volume 3, page 278)? Why also is the Government using 2003 as a Base Year for many of its air pollution projections when it admits that this was a “poor year” for air quality compared to other years this decade and that starting projections from a poor year for air quality will result in higher projected air quality than starting from a year of relatively good air quality (see Volume 2, page 112)? How can it be right, from an Environmental Justice perspective, for the Government to say that “the health benefits of reducing the average exposure of 10 million people (even if living in areas already below the objectives) by 1 microgram per cubic metre are one hundred times greater than reducing the exposure of 10,000 people (even if living in areas above the objective) by 10 micrograms per cubic metre” (see Volume 2, page 43)? Surely, apart from anything else, the risks are unlikely to be “linear” and those living in “hotspot areas” should be entitled to have not just the limit cap met urgently but to experience also ongoing improvements in air quality. 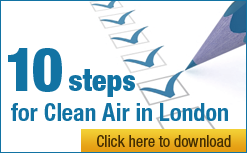 “We are dismayed that the Government and Defra have so little ambition or determination to improve the UK’s air quality and rectify even the breaches of European Union legal limits for air quality that occured in Bradford, Brighton and London in 2005 (see Volume 2, page 24) (and subsequently in Scunthorpe and Glasgow and almost in Port Talbot in 2006). No derogations or time extensions are allowed from meeting these obligations. These legal breaches were not even mentioned in the Strategy (see Volume 2, page 213). We wrote recently therefore to the European Commission urging it to ask the European Court of Justice to commence enforcement action against the UK. “With such an obvious case for reducing air pollution, we can only assume that there is still a substantial lack of political will at the very top of the UK Government to tackle this problem.